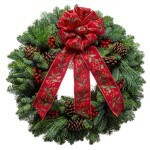 It is easier than ever to give a wreath these days, and makes a wonderful and thoughtful gift. Not only does a holiday wreath instantly spread holiday cheer, there are so many different kinds of wreaths to choose from that the possibilities are endless. Does the family have small children: If so, it’s important make sure the materials of the wreath aren’t easily pulled off in case of accidental ingestion. Does the family have pets? If so, keep in mind to stay away from wreaths that have poinsettia flowers or leaves as they are toxic to pets if ingested. Is there anyone in the household with allergies? This could be very important to avoid any allergic reactions. Will the wreath be displayed in an apartment or home? This is an important factor to consider ensuring the safety of your gift. In addition to the traditional materials used in wreaths, such as Blue Spruce, Noble Fir, Cedar and Holly, you can also choose from such materials as popcorn, cranberries, mistletoe, pine cones, carnations, poinsettias, pepper berries, gingerbread men and bells. In addition to the fabulous materials you can select from in choosing your holiday present, keep in mind the size of the wreath. Fortunately, wreaths come in a variety of sizes ranging in diameters from 3″ all the way up to 36″. The importance of knowing the area where the wreath will be hung cannot be underestimated. For the creative gift, consider getting your friends or loved one’s a uniquely shaped wreath as a holiday present. Not only are there the traditional round wreaths, but there are also wreaths in various shapes and forms. For example, there are wreathes in the shape of stars, or even put together in the shape of a chandeliers where candles could easily be displayed.